Blog #32 – A Date Has Been Set! Today is a a beautiful day! We are finally ready to reveal the release date for Raft, and it’s not far away! 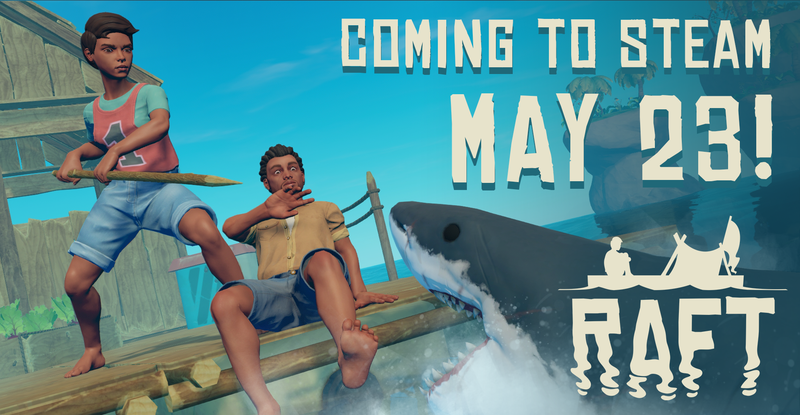 The 23:rd of May 2018 is the day you’ll be able to jump straight into the all new and improved version of Raft. Among many other things, Raft on Steam comes packed with multiplayer, reefs, islands, more items to craft, more parts to build, more fish to catch and more crops to grow. But we have not only made additions. The graphics have gotten a complete overhaul to match the vision of the game and old game play systems have been improved all around! The new Raft is better in every aspect! We have seen how excited you all have been to get into the new version and we can assure you, we are equally excited. We cannot wait to hear about your experiences and to see the rafts you will build with the new parts and features. We can also announce that Raft will be sold for 19,99 USD. While the increasing size and scope of the Raft experience may in the future alter the price for late adopters, players who join us during the Early Access period will absolutely have access to the full version of the game, however large it grows! With less than two months until release we will be focusing all our energy into polishing the game, balancing things out and making sure everything runs as smoothly as possible. As we have said before, we could not have done this without the amazing support we continue to get from our community. So a huge thank you to everyone who has been with us and kept us motivated during the development! And if you’re new to Raft we hope you will enjoy the game and we welcome you with open arms! And remember, this is only the beginning. Together with you and your feedback, Raft will continue to grow during Early Access. So, make sure to dig out your captains hat, ready the sails and mark May 23 with a big old red cross in your calendar! Here follows the full press release! The free alpha version of Raft has already been downloaded more than 7 million times from itch.io and has become a huge hit among YouTubers. I believe that steam auto-transfers currency so if euros are cheaper than USA, you will be able to buy it. Microman, most of the time we pay the same price, sometimes ever more in euro than it is in dollar. They don’t convert it most of the time. I didn’t know. But there has to be some type of money conversion in the process, right? This is exciting. This game caught my eye since the beginning. Youtubers stopped playing it, but I’m sure this will bring new motivation. I’m with you all the way! I’m super excited for this! Looks like a lot of fun! Can’t wait for Steam to unlock it so i can grab it and install it asap! Me and my whole crew are so excited! any chance of an early steam release? Oczywiście licze na to że dodacie opcje moderskie dla osób które sie bawią modami . I don’t get it will the Early Access be 19,99 or will the full release be 19,99 (and if you have the itch.io game will you get full acces to the steam one as wel or what? The itch.io game is free, of course the steam one isn’t. early access is 20.00 USD and the full release may/ may not cost more. if the price changes when you bought it cheaper or with more cost, you will not have to pay more or less. Haha, no need to thank me. I’m not a developer, just a random person letting you know. Yay! This game will be published right before my last day of school! I want ask few questions about this game. First, would you give us the Configuration requirements. I’m afraid my laptop cannot afford it. Second, the previous versions are free to the public, but i got one concern. most of the Chinese students are little bit hard to buy this game. ps: some of them are rich some are not.. Wife and I are looking forward to this, Good luck to you. Wow! Can’t wait to play it! I’ve played Raft since youtubers played it, and now it’s going to be on Steam! Any ideas on the price? Personally, I think this game should be around the 30-50 dollar bracket. It seems like a really good indie game so it really deserves this price tag unlike most other indies which are around 5-25 dollars. Hope to play it soon and see further updates and improvements. but for my two little brothers, it is hard too afford the costs. 20 dollars is oky, 30 dollars is a little bit expensive…..
i’ve looked at the twitter accounts, they’re active. but what about the blog posts? it’s been a month now. They’re working towards the release now that is only about two weeks away (May 23rd) so probably no new blog posts will be made until then. and tell me what the hell is the banana man ? It’s a very good game !!! Will this come to Xbox or PS4 later??? Looks original fun and addicting. Xbox version in works? 19.99 USD ? I cant buy with his price 🙁 . I’m a big fan Raft , and now I can not buy it ….